I've been setting myself a goal of getting more shooting done with the Crown Graphic. I've taken it on most of our recent camping trips. One of my goals is to put some "miles" on my newest lens, the Rodenstock Rotelar 270mm f5.6. This is a telephoto design actually intended for use with the Crown Graphic (which has limited bellows draw). It did survive the sandblasting which it certainly received on this trip. I don't generally include the rebate on my shots but I'm making an exception here. I had this scene all lined up when my friend, Martin, drove straight into my frame. I thought the shot was ruined and retook. However, I really like the certain something that the nose of the Nissan Patrol entering the frame gives to the shot. And it only seems to give that certain something when the entire sheet including the rebate is included. Incidentally, this and the others which will appear later are all scanned on my V700 using the large sheet of AN glass that I received some time back but hadn't a chance to use yet. What a pleasure! The V700 can drive you mad because it is both fixed focus (with an extremely narrow depth of field) and it uses fluorescent illumination which tends to heat a large piece of film enough to cause it to bulge in or out during the scan. In other words, the theoretical sharpness the scanner is capable of is generally impossible in practice. With the large sheet of AN glass I've simply taped the sheet in place emulsion facing out and then placed the sheet of glass on a template I made out of thick black board. The template has an opening in the middle big enough for the film and is just the right thickness to hold the glass at perfect focus height. I place the glass on the template with the film facing down and get blissfully effortlessly perfect scans that are sharp as a sharpened tack. I invite you to zoom in as far as you like, this sucker is SHARP. The glass also allows me to orient the film so that it misses the bad pixel on the sensor array (which I can't get anyone to acknowledge or fix here in good old middle east). 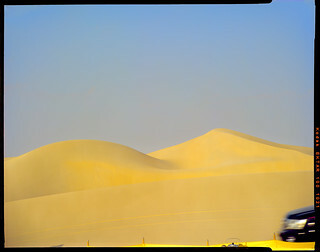 Lastly, those dunes. Isn't it a picture? With the low light from the setting sun and those soft perfect curves. I hope you like it. I could scarcely be more pleased.